Ben Adler has an "Angry Rant" over at IFA regarding the ubiquity of Old Bay Seasoning in Chesapeake Bay cuisine... and I can't see much purpose to it other than to provoke the ire of native Marylanders... to which it has succeeded admirably; at least in my particular case... but I will respond to as if it were a serious culinary question borne of innocent ignorance and not just a graceless troll from a vile New Yorker. One thing that the “Mid-Atlantic” region does have to offer is famous crabs from the Maryland Bay, and I’ve had some good crab cakes in D.C., so I thought this would surely be a good experience. It's called the Chesapeake Bay thankyouverymuch. I was wrong. The crabs were smothered in a salty seasoning that got all over my hands. ohnoes!! It got all over your hands!!!! Uhm... that's the point. You've noticed that these critters have a shell, no? So it's pretty much physically impossible to flavor the meat inside. 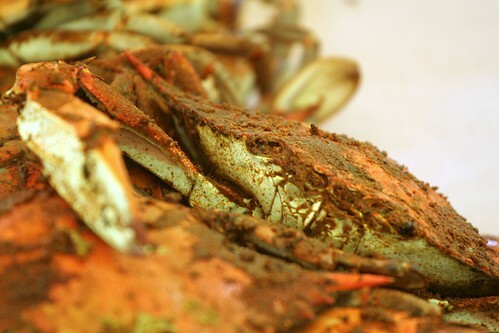 By coating the shell with seasonings, you actually accomplish that in an indirect manner as the Old Bay moves from shell to fingers to meat as you eat. When cooking fresh shellfish, everyone knows that less is more. Lobster comes completely unadorned, as do crabs in most places. You get some butter, some lemon, and that’s it. If you are having stone crabs served cold, then maybe you’ll get a sauce to dip it in, sort of like shrimp cocktail, but at least the dipping is optional. Now, I've never had stone crabs out in San Fransisco Florida[I guess it's Dungeness in Frisco - never had either], and I can't compare the experiences... so maybe dipping is a good option too... but I would argue that seasoning the shell is much much subtler. I can certainly say that in the case of Maryland steamed shrimp, whose shells are similarly coated in Old Bay, that the seasoning is much less overpowering to the flavors of the shrimp meat than traditional cocktail sauce. You really end up with the equivalent of a slight dusting as opposed to a coating of sauce, since most of the seasoning goes with the shell as you remove it. In addition, anyone who has ever eaten crabs... instead of crying like a little baby because their manicure got dirty... knows that you could probably starve to death eating crabs because it takes so much time and energy to divest them of their meager portion of meat, and that most people stop eating crabs... not because they're full... but because they're tired. If you had to stop and dip those tiny slivers of meat in butter or some kind of sauce? Forget it. People would be keeling over at cook outs left and right. Not worth it... Old Bay keeps you efficient and conscious long enough to get some real sustenance from the burgers and hot dogs. So, in conclusion... go back to your bagels and leave the seafood to regions that actually know something about it farkin' Yankee fan!!! Ahem.